That's how Washington Post columnist Steven Levy began his February 13, 2007 column. Long answer short: Not by the Atiz BookSnap (top) — but mos def "... when some company produces the iPod of e-book readers...."
Could the publishing industry get Napsterized? That was my first thought when I saw the marketing materials for the Atiz BookSnap, the first consumer device that enables you to "release the content" of your books by transforming the printed words into digital files that can be read on computers and handheld e-readers. "It's not a scanner," proclaims a banner on the Atiz Web site. "It's a book ripper." Though ripping (transferring content from an external medium to a computer) is not necessarily an act of piracy, I couldn't help but wonder whether this was a sign of impending apocalypse on Publishers' Row, a scenario that could end up with people file-sharing John Grisham's latest the way they do now with the newest Vampire Weekend tunes. Then I tested a BookSnap. Short verdict: not a revolution. More a thud than a snap, the device — an ominous three-foot-high construction draped with a thick black darkroom-style shade — looks like a Goth puppet theater and weighs 44 pounds. 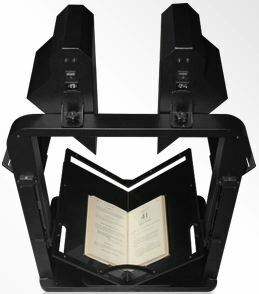 Under the shade is an angled cradle for a book and a glass platen to hold the pages down during scanning. You turn the pages yourself. It costs $1,600, not including the two Canon digital cameras (around $500 each) necessary to capture the page images and send them to your computer, where software transforms the pictures into files that can be read on a screen or an e-book reader. It takes considerable fiddling to get images set up properly. Supposedly, once you get started you can digitize 500 pages per hour, much faster and at higher quality than with flatbed scanners (which are much cheaper but not optimized for book scanning). I never got that far, but I imagine such a feat would require considerable caffeine. Still, the very existence of a consumer book scanner is one of those early warnings of turbulence to come. In the mind of its inventor, Sarasin "Art" Booppanon, scanners one day will be commonplace appliances. Four years ago, Booppanon, 28, who is from Thailand, was a graduate student at George Mason University when he got tired of making photocopies from books and tried to make his own device to get pages into the computer. He hoped to create something that cost much less than the high-end machines used by Google and Microsoft to capture the collections of entire libraries for their search engines. (Those can cost well over $100,000.) He first came up with a $10,000 device designed for commercial use, and then devised the stripped-down BookSnap. He found a partner and chief executive by watching "The Apprentice," the television show with Donald Trump. One of the contestants was Nick Warnock, a Bayonne, N.J.-born Xerox copier salesman. After The Donald uttered his trademark dismissal to Warnock, Booppanon recruited him. All but two of the 14 Atiz employees are based in Bangkok, where the BookSnap is manufactured at low cost. Booppanon and Warnock say the BookSnap — and cheaper versions to follow — will encourage people to scan their collections so they can quickly search through them and grab a shelf's worth of reading for a trip across the world or on the subway. Warnock says potential BookSnap buyers are college students, bibliophiles and just plain folks who "want to digitize their own library." But what if someone gives copies of scanned books still under copyright to a friend or two — or a few thousand friends via an Internet file-sharing site? "All copyright laws should be followed," Warnock said, knowing that to say otherwise is the kind of boo-boo that gets marketers hauled into the boardroom for dismissal. Not that publishers seem worried. "I'm not going to lose sleep over the BookSnap," said Patricia S. Schroeder, the former congresswoman who is chief executive of the Association of American Publishers. "We've been ready to sell e-books for 10 years," she said. "Everybody still likes physical books." When it comes to potential infringement, she's more worried about abuse of print-on-demand machines that can quickly turn a digital file into a printed book for less than $10. Allan R. Adler, the association's vice president for legal and governmental affairs, scrutinized the Atiz Web site and tentatively concluded that it focuses on legal uses for the BookSnap. His ire is reserved for Google's program to scan collections of libraries, and use the contents in its search indexes. The association has sued Google over that project. But while the publishers worry about snippets of copyrighted works appearing in search engines, the real threat will emerge when some company produces the iPod of e-book readers, whether it's based on Amazon's Kindle device or is an Apple production. (Ignore Steve Jobs's recent proclamation that e-readers make no sense because "people don't read anymore." He once said he didn't think people would watch video on tiny screens.) Eventually, electronic readers will become commonplace, creating a demand that won't be met by publisher-authorized releases of copy-protected digital books sold at prices similar to those of bound volumes in stores. That's when the idea of ripping books might really catch on, presumably with cheaper, cooler scanners. "It will be inevitable," Booppanon said. "And then the book industry will follow what happened with the music industry." Remember, Napster happened in a snap. Comic books are already heavily pirated. Since comics tend to be quite expensive, and the people who read them are often not very well off, there's a thriving scanned-comic scene. Comics are usually distributed in a simple format that's basically just a Zip or other archive file full of sequentially named JPGs, which doesn't give searchability, but is very easy to view on pretty much any platform.